To skip the noise in the beginning, jump to 0:43. 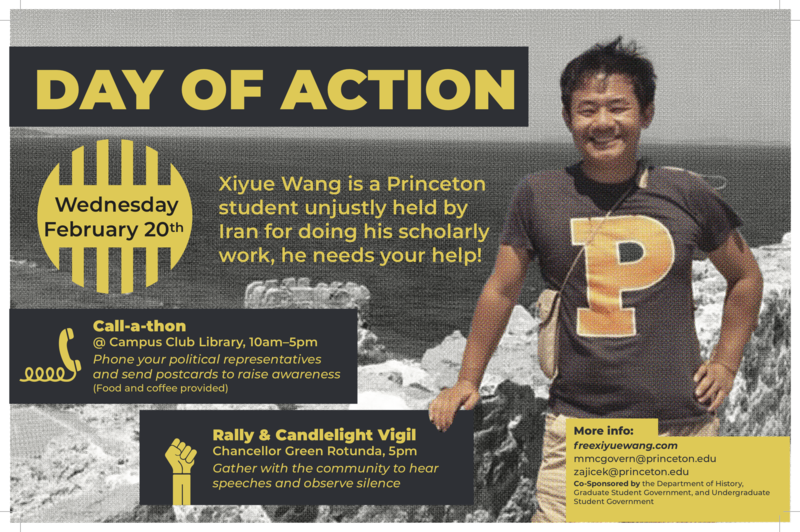 A call-a-thon and a campus rally organized by graduate students brought renewed attention Wednesday, Feb. 20, to the plight of Xiyue Wang, a Princeton University graduate student imprisoned in Iran for nearly three years. About 150 students, faculty, staff and friends of Wang and his family held electric votive candles in Chancellor Green as several speakers decried Wang’s unjust detention. “On this Day of Action, every phone call made, every message emailed on Wang’s behalf, every person present in this room reaffirms the resolute spirit of this community to continue to work for his safe release,” said Sarah-Jane Leslie, dean of the Graduate School.